Healthy Soils, Healthy Seas Rhode Island Project Launch with Clean Ocean Access and 11th Hour Racing. NEWPORT, RI – On Friday, December 7th U.S. 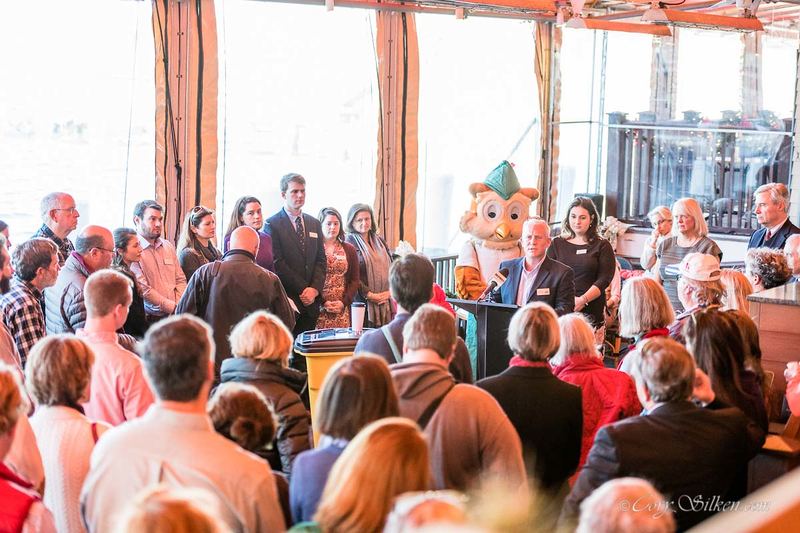 Senators Sheldon Whitehouse and Jack Reed and DEM Director, Janet Coit, gave remarks at the launch event of an innovative multi-year project spearheaded by Clean Ocean Access, a nonprofit organization based on Aquidneck Island. Healthy Soils, Healthy Seas Rhode Island is a two-year long initiative funded by 11th Hour Racing that aims to inspire long-lasting environmentally responsible behavior by tackling ocean pollution at its root: on land. Clean Ocean Access will lead Healthy Soils, Healthy Seas RI, bringing together composting efforts across the state in partnership with existing food-waste-diversion groups: The Compost Plant, Rhodeside Revival and the Aquidneck Community Table. The three partners serve as the boots-on-the-ground team that will manage all commercial and residential composting collection and processing with an initial focus on Aquidneck Island. An educational pilot program, “Yes, In My Back Yard (YIMBY),” for backyard composting.Grant funding from 11th Hour Racing allows Clean Ocean Access to subsidize the composting programs and offer discounted rates to the first round of customers who sign up through Healthy Soils, Healthy Seas RI. The initiative brings together diverse stakeholders that include non-profit organizations, academia, government, local businesses, and industry with the hope of expanding an integrated materials management initiative throughout the State of Rhode Island. Plastic makes up 10-15% of the material entering Rhode Island’s landfill. Organic waste and debris makes up another 30-35%, and the Johnston landfill is expected to reach capacity by 2034, according to a recent report published by RI Resource Recovery Corporation. With the potential to divert nearly 50% of the materials entering the landfill, integrated recycling and composting efforts could double the landfill’s lifetime through 2049 and mitigate costly expenses associated with out-of-state tipping fees. “There’s a real spirit of bipartisanship around oceans,” said U.S. Senator Sheldon Whitehouse, speaking of the work being done at the national level to tackle plastic pollution and marine debris. He emphasized the critical role local projects like Healthy Soils, Healthy Seas RI play to spark national urgency around the problem of ocean pollution. By encouraging people to think critically about their waste footprints, Healthy Soils, Healthy Seas RI aims to spark long-lasting behavior change that empowers people to reevaluate the need for low-and-no value materials entering the landfill, or worse, polluting our ocean. For more information about Healthy Soils, Healthy Seas RI, and to learn how you can join the first wave of participants turning the tide on ocean pollution visit: http://www.cleanoceanaccess.org/hshsri/. About Clean Ocean Access: Since 2006 our mission is action today so future generations can enjoy ocean activities, with an exclusive focus on Aquidneck Island. Living on Aquidneck Island defines a coastally inspired life; so our cause of working for clean beaches, healthy oceans, safe swimming water, and public access of the shoreline is what we do, all year long. We are a tax-exempt not-for-profit organization, learn more at www.cleanoceanaccess.org. About The Compost Plant: The Compost Plant will produce significant quantities of high-quality compost for the retail and wholesale marketplace in southern New England, building a unique Rhode Island brand that capitalizes on the surging interest in locally and organically-produced food. Learn more at www.compostplant.com. About Aquidneck Community Table: Aquidneck Community Table (ACT) combines civic conversation, local entrepreneurship, institutional partnerships, and digging in the dirt with the principles of an equitable food system for all on Aquidneck Island. After successfully bringing three related groups under one organizational umbrella in 2016, ACT uses that collective energy to strengthen the island’s food system; to support the local economy and expand access to fresh healthy food for all; and to act directly to grow more food, preserve open space, and teach life skills. Learn more at www.aquidneckcommunitytable.org. About Rhodeside Revival: Rhodeside Revival was born out of the idea of providing a service that brings the community together in an effort to reduce waste, while also creating quality compost for your garden and giving back to our schools, gardens and other institutions within the community. Rhodeside Revival operates a curbside composting program that brings your home’s food scraps away from the landfill, and into the garden. Learn more at www.rhodesiderevival.com.